Are you looking for peace and comfort during your vacation? If so, this holiday home is the ideal place for you. This vacation home is located near Sprimont, a peaceful village at the edge of the Ardennes, 20 meters from the owner's house. You enter the house at street level through a private entrance. The staircase leads to the living area which is on the same level as the terrace and the garden. It has an attractive decor and the fireplace creates a cozy warmth during cooler days (the first timber package is offered). 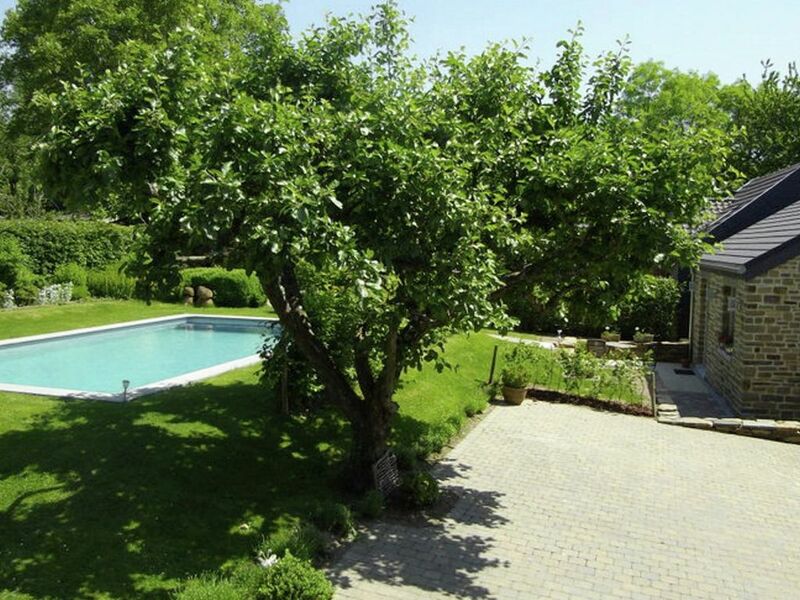 In the summer, take a refreshing dip in the pool, which is shared with the owner, or play a friendly game of pétanque in the nice, large garden. This holiday home is aimed for couples. The hilly region has much to offer. For your daily groceries you can go to Aywaille. In Sprimont (2 km), you can visit the Stone Museum. The caves of Remouchamps are 7 km away. Golfers can tee off at the golf course in Gomzé. And of course, you shouldn't miss a visit to the town of Spa (23 km) with its thermal baths, terraces, cafes and restaurants. The accommodation is exactly as described. The pictures reflect the space and brightness of the property. It's extremely clean and has everything you need for a very comfortable and relaxing stay. The owners were very welcoming and we had lots of privacy. I would highly recommend for anyone to stay here. There is parking, close to shops and it's in a very peaceful area. Perfect for a lovely little holiday. Voor de tweede keer geweest en het was weer fantastisch. De eigenaren zijn erg gast vrij en het huisje was wederom weer schoon en van alle gemakken voorzien. Super omgeving en genoeg te doen. Zeker voor herhaling vatbaar. We moesten even zoeken waar het huisje was maar eenmaal aangekomen waren we onder de indruk van de prachtige omgeving. Het huisje zag er keurig uit en van alle gemakken voorzien. De familie daar was heel gastvrij. We hebben elke dag een trip gemaakt naar de mooie plekjes in de omgeving. Door de heuvelachtige wegen is het soms moeilijk om daar te fietsen.